Are you a regulatory affairs consultant looking to expand your service offerings to your existing clients and increase your client base? Arazy Group is opening Licensale for consultants in the medical and IVD device industry who wish to develop their practice. LICENSALE.COM is the most advanced system for medical and IVD device registration management. Licensale can effectively manage your client’s applications in multiple markets, through automating a significant portion of the compliance dossier preparation. This allows you to easily initiate, modify, and monitor your client’s registration projects in real-time. Communicate with expert reviewers from around the world to ensure a well-prepared application ready for submission to any regulatory affairs agency in the 100+ countries the service is available. 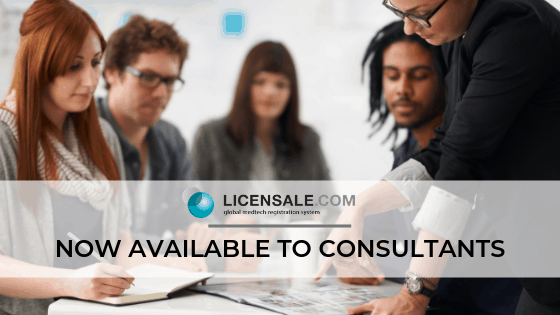 Take your consulting business to the next level with Licensale.com. Gain access to the next generation- Licensale 2.0. LICENSALE 2.0 is expected to be launched end of April this year, and it will have advanced and improved features for consultants. It will provide new capabilities to execute daily registration work, and also tools for consultants to oversee the overall progress of all registrations, renewals, transfers, or amendments. Consultants can also take advantage of its business strategic planning tools for entering new markets. Watch the 5 Minute Presentation of Licensale 2.0. Set-up a personal meeting and demo of LICENSALE.COM® to learn more about Licensale for consultants.